What is ambergris? From the old French ambre gris meaning "grey amber", Ambergris is a grayish waxy substance found only in the intestines of 1% of sperm whales. Sperm whales cannot digest the beaks (mouths) of squids, and these accumulate in their stomachs, triggering the slow layering of squid beaks with concrete like faeces to create a hard ball that whale waste can pass. Once secreted, it can float for years on ocean currents before finally washing ashore. Ambergris is incredibly valuable and is used as a fixative in the perfume industry although was also used in the recipes of the rich many hundreds of years ago. I've always been fascinated and intrigued by ambergris, both how it is formed and why it is so highly valued. 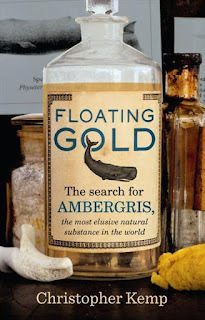 After reading Floating Gold by Christopher Kemp, all my questions have been answered, and I have a new-found respect for this substance and the whales that produce it. Kemp has a natural and engaging writing style, mixing his personal search for ambergris with all manner of information sprinkled in between. Despite the non-fiction topic, I was never distracted or bored reading Floating Gold. In fact, the ending made me exclaim out loud, and was probably the BEST ending in a non-fiction book I've read in years! (I'm not going to spoil it for anybody wanting to check it out though). There's also a lot to enjoy for Kiwi readers too, as much takes place in New Zealand and Stewart Island. "...a French perfumer whose nose was so sensitive that he could smell a vial of jasmine essence and identify not only the country in which the flowers were grown but whether the machines they were processed in were made of aluminium or stainless steel." How incredible! Floating Gold is full of amazing and incredible information, and I thoroughly enjoyed exploring this secretive and widely unknown world. Sounds like a very interesting book. Loved your review. Thanks so much Ceri. Author Christopher Kemp has just agreed to an interview, so stay tuned for more very soon! You're welcome Carole, this was definitely my favourite read for May.